GE refrigerator displaying an error code? 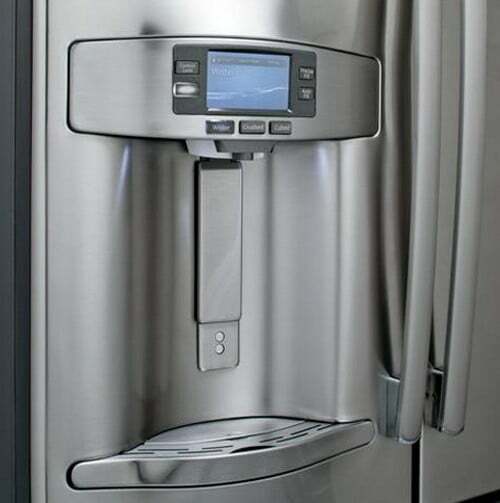 Newer style GE refrigerators have built in diagnostic systems. If your profile refrigerator finds, sees, or detects a fault or error in the system, it will show an error or fault code. The error code will display where the usual numbers are on the display screen. When an error code is displayed, your refrigerator is telling you a specific fault. If the error or fault is not fixable by you, it will require a repair technician. There are many different model numbers of GE refrigerators with digital displays so if you see an error code write down what is flashing or displaying. Don’t pull the power from the fridge if it shows an error code. If you pull the power plug it will erase the fault code. A flashing green error, fault or function code will be displayed on the control panel when a failure has been detected. This will be accompanied by a beep. Here is a list of error, fault and function codes and what they mean. CC: Check the temperature controls as the temperature for the refrigerator is not correct. CI: Check the ice maker for proper operation. DF: No current flow through the defrost circuit in 48 hours. dE: The defrost system has not been operating properly in the last 24 hours. FF: Check frozen food for thawing because the temperature is rising excessively. PF: The power to the refrigerator has been out from a power outage or similar. tC: If the temperature display shows a tC (could look like an EC, an upside down F with a C), this is not an error code, it is the Turbo Cool (tC) setting. tF: If the temperature display shows a tF (Could look like an EF, an upside down F with an F), this is not an error code, it is the Turbo Freeze (tF) setting. Refrigerator/Freezer Condition = Possible power surge/electrical issue. Repair or Check = Clear the display by unplugging the refrigerator for 5 minutes and then plugging it back in. The control board may have experienced a power surge. Repair or Check = Freezer temperature has been above normal temp for more than 120 minutes. Adjust the controls according to the instructions in your GE manual. Close the refrigerator and freezer doors completely. Replace the door gaskets if needed. Press the System Check button to clear the error code. Repair or Check = Clear jammed ice cubes from the ice mold. If the ice mold isn’t filling with water, turn back on the water supply to the ice maker. If you turned off the water intentionally, also turn off the ice. Press the System Check button to clear the error code and check for other system failures. If the CI code reappears, replace the complete ice maker assembly. Repair or Check = The defrost cycle has not run for more than 48 hours. Unplug the refrigerator and reconnect any loose wires in the defrost system. Replace the wire harness if needed. Replace the defrost heater if it is damaged. It may be normal for the refrigerator to operate without defrosting for more than 48 hours when operating in an area that’s below 55F degrees. Reset the code by pressing the System Check button. Repair or Check = Check defrost heater, defrost thermostat and the defrost timer. Press the System Check button to clear the error code. Repair or Check = Freezer temperature has been above normal for more than 2 hours. Make sure that the refrigerator and freezer doors are closed. Replace the door gaskets if needed. Press the System Check button to clear the error code and check for other system failures. If the PF code appears, then the FF code, this was likely caused by a power failure. Keep the refrigerator and freezer doors closed as much as possible to allow the interior temperatures to come back to normal. To clear an error code on your GE refrigerator, press the System Check button to clear the code. If the code comes back, then this means a component, part, or other problem is present in your refrigerator, refer to the codes above. 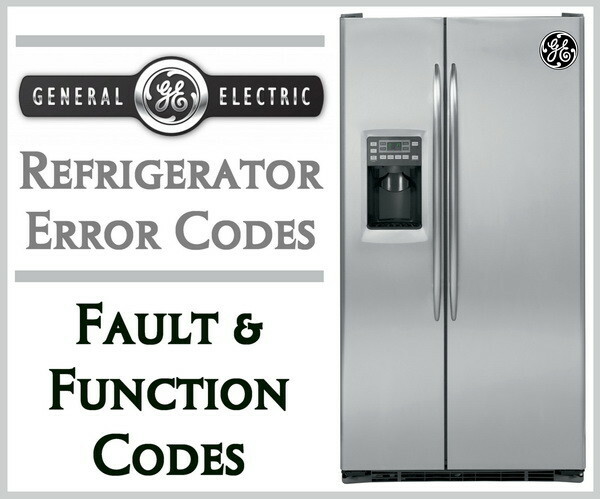 Do you know of any other GE refrigerator error codes we have not mentioned or are you having trouble with your GE fridge? Please leave a question or comment below and we can assist. I have ordered a new evaporator fan because the symptoms matched perfectly for the problem that I was having, and when I pulled the fan I tested it by plugging it in. It didn’t work originally, but then when I moved the wires it turned on…I figured it should be replaced. I want to make sure I am getting all codes addressed though. I can’t find a code sheet. I have a GE Profile PSE25VGXICSS #AV406510. It is flashing ‘zero’ and after while the flashing zero stops (thus diagnostics finished) and the display panel keeps switching on and off and the compressor does not stay on enough for the refrigerator to function optimally. Hi Angelo, I have a GE PGMS5RKFHSS with the same problem ( flashing ‘zero’ ) like you indicate in your past technical issue. Please could you tell me how fixed the “Zeros Display” in your control panel. What is error code LF. It appeared after the water filter was changed. Refrigerator model GYE22KMHHES, 18 months old. Refrigerator has started going into Turbo freeze mode on its own. Frig and freezer are both fairly full. Temp in both freezer and frig appear to be normal (set at 1 degree and 34 degrees). Is it possible that we have blocked a fan outlet or is this an indication that the frig is starting to fail. I know that literature indicated turbo freeze is not an error but there is no explanation as to what triggers turbo freeze. We never experienced this in the first 18 months and we are not keeping the doors open any more than before. As far as I know there are no coils to clean on this model. What other factors would cause this other than keeping doors open. How would vegetable and fruit setting on drawers affect temperature in frig? Does one of these settings make the drawers colder than the other? GE Refrigerator #TFX27F has been working perfectly, maintaining proper temperatures in freezer and frig. DE error code came up on control panel, went out when I defrosted refrigerator for several hours. Light returned to flash DE after 48 hours. I checked temperatures again and they are at proper temperatures. Service department at local store advises me to purchase a new refrigerator, as this model is 25+ years. It operates well except for the flashing red DE. Can I ignore this warning or is there a way to remove the flashing letters? Ge fridge freezer code 88. 88. The last 8 flashes 8 and a capital A. Fridge cool freezer not even close. Had fridge frozen so defrosted but now this is it. I dont think the frezzer was working before this either. Display resets when pressing top two buttons but no freezer. I have GE bottom freezer French door refrigerator, model # GFSS6KKYESS Serial No: HZ900156 and having problem with my control panel which shows freezer side 88 and refrigerator side blinking 86 and 88. I tried to reset the panel by holding energy saver alarm light for 30 secs with no use, the second one. The problem I’m confused can you suggest me what is happening here? Control panel blinking, freezer side it says 88 and refrigerator side it blinks between 86 and 88. It seems freezer is working fine, refrigerator is not cooling as it supposed. I tried resetting the display by holding energy saver and Alarm/light. What could be the problem. can any on give me a little insight. We purchased our new GE refrigerator with a keurig. When I press start heating it shows the word error. How can we fix it? I have just replaced the main board on a GE profile PCE23NHTJFBB side by side refrigerator and it seems to work fine except the temp display is in F instead of C as i am in the UK. I would like to change it back as before if at all possible. I have a GE Profile model PFSF6PKXDBB refrigerator and the bottom freezer does not freeze anymore, ice cube maker does not work, fridge seems OK.
We unplugged it for a while and then got error code(s) 88 and 6A or GA. Please suggest which part(s) need to be replaced. I have the same exact problem with the same codes 88 and 6A. My model number is the same as your’s except for the last 3 digits PFSF6PKXCBB. We had a Sear’s Repairman come look at it and he couldn’t find either of the fault codes in his computer. Does anyone have any suggestions on which part(s) need to be replaced. GE Refrigerator gfe26gshss displays an error code of an upside F then the letter C.
GE REFRIGERATOR = Turbo Cool (tC) setting. If the temperature display shows a tC (could look like an EC, an upside down F with a C, or something similar), this is not an error code, it is the Turbo Cool (tC) setting. My GE refrigerator model GFE28HSH SS no longer makes a beeping sound when pressing the buttons on the control panel on the front of the refrigerator. Is there a setting that will turn this feature back on? Seems to be on and cooling. Only thing on the display is a red triangle. GE Profile PWE23KSDESS display panel is not working. Where the temperature should be displayed, the digits are rolling in circles. We have turned the fridge off for 5 minutes. GE GFE28HMHES Fridge-Freezer was purchased and plugged in. We left for a 2 day holiday and the thing never cooled off. 56 degrees in freezer. 55 in fridge. All frozen food trashed. All perishable fridge items trashed. Now code says ” dE no “. Is this what 2800 dollars buys these days. I should be worry free for at least 10 years, not 10 minutes. We just put in a new Motherboard, after which the compressor and it’s fan ran continuously for over 24 hours. Now the refrigerator is silent and not running it seems. The compressor feels fairly warm. I’d like to see if the Reset you mention above will kick start the refrigerator into operation. Can you help? I’d appreciate very much. On your model of refrigerator the GE PSF26NGTD, there should be some wire harnesses at the bottom right under the refrigerator door that supply power to certain parts of the fridge. You could try making sure they are connected properly and then disconnect and reconnect. If you replaced the main control board for your refrigerator, what was happening with the refrigerator before that made you replace it? Was the problem the same after replacing the board? Did you replace the board with a GE OEM part? Are all the wire harnesses that connect to the main board secure and not damaged? Have you set the correct temp on the temp control and let the fridge sit for at least 48 hours to stabilize? How long has the refrigerator been silent since it ran for 24 hours continuously? Thanks for response. The main control board was replaced with an approved GE motherboard. The problem before replacing this control board was that the electronic temperature settings showing at the top front inside the refrigerator were increasing in increments every day, while simultaneously noticing that the refrigerator was not cooling properly and finally did not cool at all – whereas the freezer though not cold enough was still cold. At this time, a clicking noise was apparent coming from the rear back. After the mother board installation, the appliance is running, the compressor and compressor fan are in motion and the freezer settings show 22 – 26 F and the refrigerator settings show 56 – 60. So the initial problem of the refrigerator not cooling is not fixed. It appears that now there is a fine frost showing on the back inside panel of the freezer, though previously there never was frost there before. It could be the defrost heater in the freezer or the freezer temp sensor or thermostat are the cause. My GE model GFE28 fridge works fine, but the beeping sounds it makes are driving us crazy. There is a code tF on the display – I understand this is something about the turbo freeze and not an error code, but how do I make it shut up??? All the constant beeping actually wakes us up at night since the kitchen is just off our bedroom. Any help would be much appreciated. 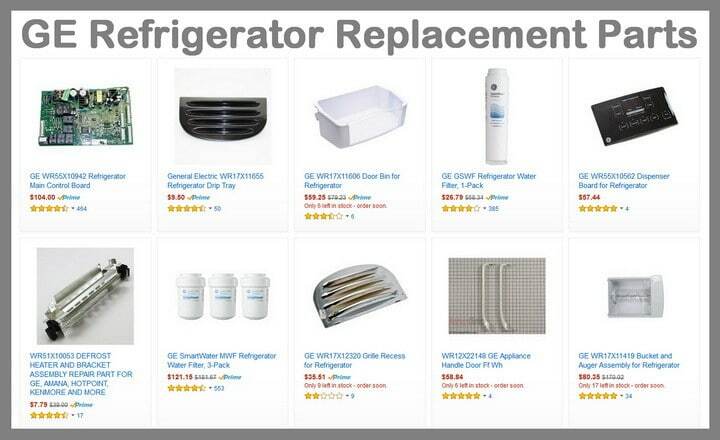 Can you give us the FULL model number of your GE refrigerator and we can tell you what part to replace or what you can disconnect to stop the beeping. Thank you! The display is clear now. I appreciate your quick response. Just got my new replacement GE refrigerator today and the delivery guys set it up about 4 hours ago. There is a code on the front panel where the fridge and freezer temp should be reading. It looks like an upside down capital F and F on the freezer and an upside down F with a C on the fridge side. What does that mean? Those codes usually mean the temp is rising too fast in the freezer. If the fridge is new, let it sit and run for 24 hours and the codes should clear. Since the fridge is new, it may display different codes as it gets to the proper temp. If the issue still happens after 24 hours, let us know and we can assist from there. My power went out today and when it came back on everything seemed to be working fine with the exception of my refrigerator. The screen on my refrigerator only displays the GE logo, it will not allow me to select ice, water, auto fill or even light. There is no error codes. What does this mean? Is your GE refrigerator cooling or is it just a display error? Can you give us the model number of your GE fridge? You will need to run it in diagnostics mode and see what you can find. Just look up GE refrigerator “your model number” diagnostics mode on Google. Unplug the wire harness that goes from inside the fridge to the display panel and plug it back in. It may reset it. Do this with the refrigerator power OFF or unplugged. Model# pye22pshiss. Same issue: Power outage. GE Logo only. No buttons functioning. Disconnect wire harness —-is this located underneath left door? Did you guys every figure out the problem with this? I Am having the same issue. Thanks of your help. New GE Fridge, within an hour received a message on front display “Your refrigerator has detected a potential leak.” Called into service, tech said he has nothing written about this error, and scheduled a service call. 2 hours after owning this Fridge, I am now awaiting on a service call :-(. Service guy shows up, looks at the panel, and said he has never seen one of those errors! Plugged his laptop into usb port on top of Fridge, then changed out the filter with the bypass, same problem, next a new filter, same problem. Reset Fridge, used the water dispenser for about 4 minutes, error returned. Filter sensor board was removed and checked, indicator light said it was ok. Next he changed out the complete mother board, and withing 5 minutes the error returned. Said it would take at least 2 weeks for him to order other parts, I told him I was going to return the Fridge back to the seller and order another one. GE QC fell bad on this one. GE design fell bad on this one also, don’t need an rf chip encoded filter to tell me when to change the filter! This failure turns off the water supply and the ability to make ice. I am now buying bags of ice to fill my new Fridge. Next post: What LED Light Strips or Ropes Are Best To Install Under Kitchen Cabinets?